The following email (below) was shared by Stuart, a YTC Newsletter reader, in response to last weeks article, "The Second Greatest Trading Book in the World". MindMaps are an exceptional tool for structuring your learning environment. I only wish I could have been so organised back when I went through my initial learning phase. Instead of a nice neat mindmap, I have a bookshelf full of disorganised notebooks and folders full of printouts. Have a read of Stuart’s email, and considering using a MindMap to direct your own trader development. 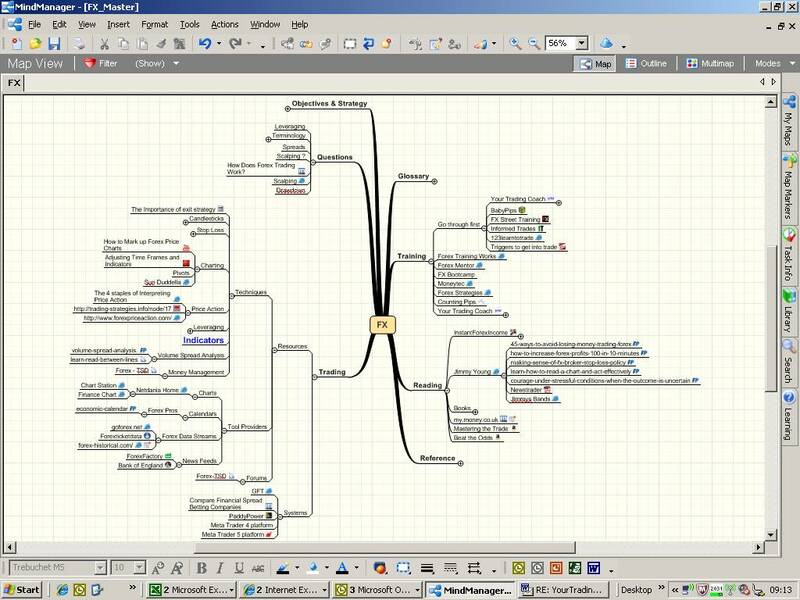 A screenshot of his MindMap is included. There are numerous commercial products available. Before considering them though, you may wish to experiment with an open-source version (FreeMind). I find it quite an effective tool, although lacking in some of the extra features of commercial equivalents. It’ll provide a good start though if you’re new to MindMaps. 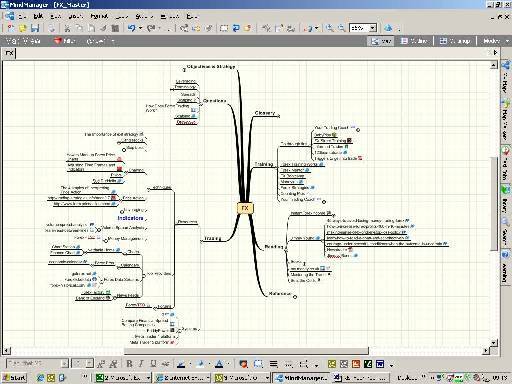 In my current profession I have used mind mapping with great effect. I have no affiliation to any of the Microsoft products but my real world experience finds them really helpful. I have used this for my entry into trading and Forex, which has proved invaluable as the sheer quantity of information and wandering threads can overwhelm you. What I find is it enables me to sift the junk, keep the good stuff and develop things into what my persona is going to be as a trader. As you rightfully say, strategy and plan are key and I believe these are created to suit ones own image and personality which refreshingly this new topic is making me soul search and think hard about me. It is very helpful as it can grow, be edited and all the things (hyperlinks to either web or file content) move as well. I am not saying it is a panacea but it certainly helps on any journey that is started that will develop and all the paths are not known. I also find it helpful to print it out and have it on the wall next to my desk and get the red pen out as things happen, keeps it fresh. Attached for example is mine, a novice and which contains some great stuff and also some really bad stuff but it is reflective of my foray so far. I use categories and filters so I can evolve the stuff that has merit and archive the rest. It has some nice features of linking, capturing notes and pictures and being exportable to other office products to form presentations, word documents with table of contents and also PowerPoint. Just throwing it into the ring, please ignore if it is too much.